Only Arizona’s Pleasant Valley War, which took the lives of twenty to fifty men between 1887 and 1892, outstripped the Lee-Peacock feud of northeast Texas. The fandango grew out of lingering animosity over the Civil War. Confederate veteran Bob Lee butted heads with an organization of Union supporters. In response Lewis Peacock, the leader of the Union bunch, rounded up a posse to arrest Lee for alleged war crimes. To “settle the charges,” Peacock seized Lee’s valuables and exacted a promissory note for $2,000. Lee won a subsequent lawsuit, earning an assassination attempt along with the money. His doctor was murdered while Lee convalesced in the medic’s home. Thereafter, northeast Texas fractured along Union-Confederacy lines and bands of armed men proceeded to track down and do away with their ideological opponents. The Fourth United States Cavalry’s arrival to end the fracas only made things worse: Although a house-to-house search failed to turn up Lee, it sparked several more gun battles. Lee was betrayed by one of his own men in 1869 and died during the cavalry’s attempt to arrest him. 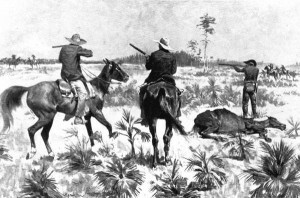 Fighting continued until Peacock’s shooting death in 1871.